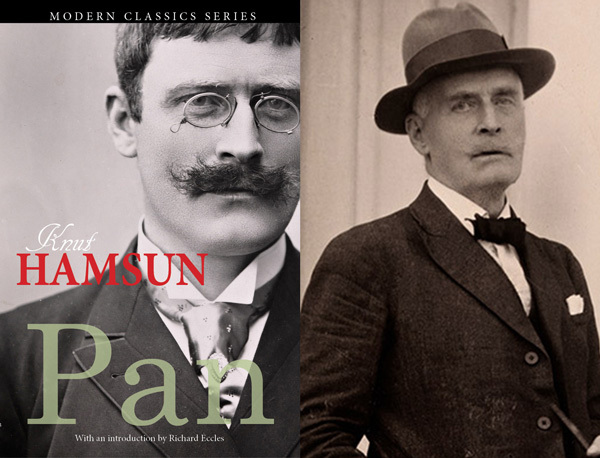 Richard Eccles talks about his fascination with the great Norwegian writer Knut Hamsun and his newly edited re-issue of Hamsun’s stunning novel Pan, the first in our Modern Classics Series. If you had to lure a contemporary reader into exploring Knut’s Hamsun’s novels what would you say? Hamsun is in some ways the perfect antidote to modern life and the worst aspects of modern literature. From our perspective in the 21st century he takes us into a magical, remote world stripped down to its most realistic and extraordinary essentials. He is painfully aware of all of the modern challenges, disruptions and psychoses, and describes them in such biblical simplicity that most readers can never forget what they have just read and want more. He is also the least gimmicky of story-tellers and never fails to keep the story and the characters at the heart of every sentence, at the same time as being the most modern of novelists in his themes and understanding of the human condition. And why Pan, why now? Worster’s beautiful translation came out in 1921, just after the First World War. It was the first translation of this novel in to English and is in many ways still the most striking. Like Hamsun in Norwegian, Worster writes in a way that is old-fashioned, from a bygone age, in English. I wanted to celebrate those turns of phrase, the spelling conventions, the simplicity of his achievement for a new audience. For me personally, I remember reading the novel late into the night for the first time – the Norwegian original – and being by turns delighted, baffled, intrigued, astounded and utterly enamoured by this visionary writer and his poetic, ‘Danishified’, sparkling and obscure language. So, on a personal level, it feels such a culmination of a long-held dream to contribute to a new edition. For readers new to Hamsun I would ask them when they have read it to compare it to anything else by any other writer. I have a feeling that I may know the answer to that. And for someone still undecided as to whether to read it or not I would ask a simple question: does your soul need feeding? It sounds a bit ‘hippyish’ but who can say they have enough food for the soul? Is Pan typical of Hamsun’s work? Yes. It’s certainly typical of his early work. It contains the powerful autobiographical elements that often mark the early works of writers. The main character is a charming, attractive, flawed, sensitive outsider who disrupts the small coastal settlement he finds himself in. He doesn’t mean to, but he can’t help it. He also doesn’t mean to fall in love but all around him love blossoms. And the setting is immense and brooding and Hamsun means to set human actions against these irresistible eternal forces of nature. In almost all of his novels Hamsun’s characters interact with nature in ways that modern urban humans don’t but yearn to do. In Pan Hamsun is describing himself and ways of thinking about nature and our place in it and consequently all our places in it in ways that connect directly with our sense of modern alienation, paranoia, rootlessness and the whole range of modern dissatisfactions. Many readers sense in Hamsun’s best work causes for this despair and also some remedies. Why do you connect with Hamsun’s writings? These last few days I have been thinking and thinking of the Nordland summer, with its endless day. Sitting here thinking of that, and of a hut I lived in, and of the woods behind the hut. Like a mantra or a poem, those lines are etched in memory but I can also imagine reading those lines by the soft light of the midnight sun or hear the crash of the rockfall down the fjord hillside on a miserable late autumn day when there is not a sound to be heard in all the world than perhaps the wind in the trees. Hamsun conjures worlds and peoples these worlds with character after character that we have met or want to meet. And behind it all lurks a man with no gods, no dependences, no dogmas and twinkling eyes.